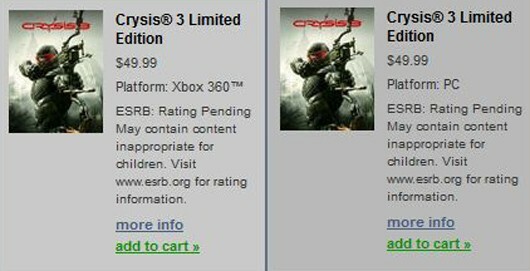 EA's online service reveals box art and pricing info for an upcoming Crysis sequel. In a surprising turn of events, EA's Origin service briefly leaked some preliminary information about Crysis 3, the sequel to last year's hardware-melting Crysis 2. The info was screencapped by Neogaf forum users before being taken down by EA, and interested parties can still find Crysis 3's store page through Google. Other than some pricing info and box art, the leak doesn't do much more than hint that we'll be battling once again in an urban setting using the high-tech Nanosuit seen in the previous Crysis games, and some kind of futuristic compound bow may be a prime weapon of choice available to players. However, exactly why exactly a commando wearing a highly advanced set of super body armor would be using archery to battle against alien invaders has yet to be explained. Neogaf users also point out that GameReactor magazine has hinted at a more detailed reveal later this month, so the Origin leak doesn't do much more then steal some of its thunder. The leak also doesn't specify a release date for Crysis 3, but does list a retail price of $49.99 USD for both the Xbox 360 and PC versions of the game.